But too much of it may be horrible for your job and career prospects. 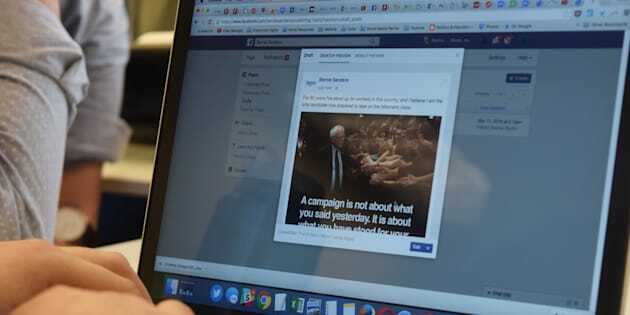 For some people, like campaign staffers, social media is work. Do you use Facebook at work? Good news, kind of: That may be the best way to cope with the grinding banality of office life. A team of researchers in China has published a theoretical paper that draws attention to the use of social media at work as a means of self-therapy when young workers end up in jobs that aren't right for them. The research, which appeared in the most recent issue of the journal Employee Relations, suggests that the use of social media at work can be a positive thing, as long as it's done in moderation. A little bit of personal social media can spur creativity and give workers an outlet for their stress, the researchers say. But too much social media use, as you might guess, makes people unproductive and often signals that the person feels alienated from his or her job. Basically, the theory goes, students who go to good schools are under the impression that they will have great, fulfilling, fascinating jobs as soon as they hit the workforce. The reality, especially for more average students, is usually quite different. When their jobs turn out not to be fulfilling, young people often turn to various coping outlets -- particularly social sites like Facebook, Twitter and Instagram -- to help mitigate the stress that comes with their new jobs. The researchers suggest that this isn't necessarily a bad thing. A small amount of time spent on Facebook (or the social network of your choice) can actually reduce stress, increase creativity and make young people better at their jobs. But there's a point -- and it's hard to say where exactly -- past which Facebooking becomes a negative factor and adversely affects a person's work. Jhony Ng, one of the authors of the paper and a professor at Nanjing University of Aeronautics and Astronautics, says he can't quite define that threshold, but he knows it when he sees it. "The line should be at where one’s non-work-related social media use does not affect their job performance," Ng told The Huffington Post in an email. In other words, if you spend some downtime on Twitter in between projects, it's probably good for you. If you spend all afternoon on Facebook instead of finishing something your boss asked you to do, that's probably bad. In an unscientific Twitter poll conducted by this reporter, who was definitely not using social media to slack off, nearly half of the 2,028 respondents said they use social sites to cope with their jobs. Nearly one-quarter say they do not. Another 31 percent do not take Twitter polls seriously, judging by their response of "lol." Do you use social media at work as a coping mechanism for dealing with the job that you hate? When young people feel stressed out at their dull, unfulfilling jobs, the authors speculate, it's partly because no one ever told them when they were students about the kind of drudgery and indignity that usually permeate one's early years in the workforce. "How many advisors tell students that the glamorous banking jobs they see in Hollywood movies will not be available to most of them?" the paper asks. The paper only looks at young workers, which is deliberate. Young workers have less experience, and are therefore more likely to be in low-paying, low-prestige jobs that aren't a good fit for them temperament- or skillwise. Plus, they simply haven't yet adjusted to the realties of adult life, which for many people include too much work and too much stress for too little pay. But Ng speculates that social media use will probably decrease as employees get older, "when young workers have truly lowered their career expectations over time, or when they have managed to find more fulfilling jobs." There's other research that backs up the idea that young workers are particularly stressed. In a Harvard Business Review article from March, data scientist Ran Zilca wrote that one's late 20s are often the most stressful time in life. "Most people start to experience an increase in positive emotions as early as their late thirties, and a few years later also experience a significant improvement in overall satisfaction with life," Zilca wrote. Then again, there's one thing the article doesn't mention: Sometimes, even at a good job, there's just time to kill. Antonia, a millennial who works as an immigration officer in Mexico and who asked to be identified only by her first name, told HuffPost that she loves her job and her bosses. However, her office is new, and there isn't yet much for her to do. For those times, there's social media. It's a way of coping with boredom "in the dead hours where people don't come or there [are] no appointments for special cases."